PLO official confirms PA asked US to end funding for security services due to fear of lawsuits over support for terror. US aid to the Palestinian Authority’s security services will end this week at the PA’s request, senior PLO official Saeb Erekat said Wednesday, according to AFP. The move is meant to preempt lawsuits over alleged support for terrorism. The PA has demanded the funding stop at the end of January for fear it could expose the PA to costly lawsuits under the US Anti-Terrorism Clarification Act (ATCA), which comes into force on February 1. "The money will be cut off," Erekat told AFP, adding, "We don't want to receive any money if this will take us to court." The ATCA legislation passed by Congress last year provides for any government that receives funding to be subject to US counterterrorism laws. The PA faces potential lawsuits from families of American victims of past Palestinian attacks. The aid of around $35 million a year was in support of Palestinian security forces in Judea and Samaria, which cooperate closely with their Israeli counterparts against Hamas and other radical groups. 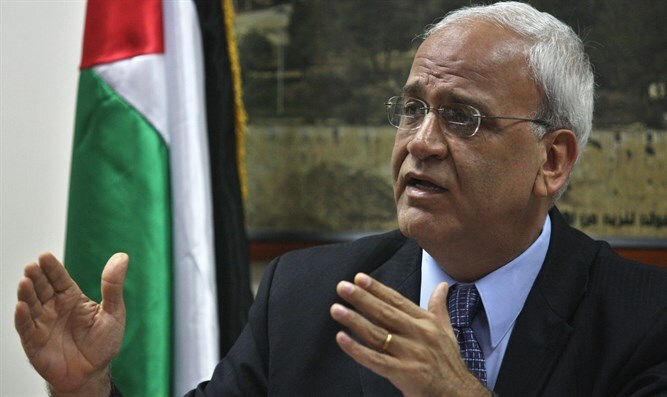 Erekat, however, denied the PA was seeking a way by which the funding could continue without exposing the government to the ATCA. "We are not seeking anything. The Americans have made a decision," he said. "But we are going to continue being part of fighting terror in the region." Since 2018, the US has cut aid to the Palestinian Authority, both by congressional action (including passage of the Taylor Force Act) and changes in policy by the Trump administration. Trump's administration decided several months ago to completely halt its funding for the UN agency for “Palestinian refugees” (UNRWA), which had previously stood at around $350 million a year. Later, it announced it would cut $25 million more in direct aid to six hospitals that primarily serve Palestinian Arabs in Jerusalem. In September, Washington cut aid to the PA for programs supporting conflict resolution with Israelis. Israeli and US officials have regularly blasted the PA for continuing to pay terrorists imprisoned in Israel and their families, thus encouraging further violence. PA chairman Mahmoud Abbas has continuously stressed that “families of the martyrs will continue to receive their allowances in full."